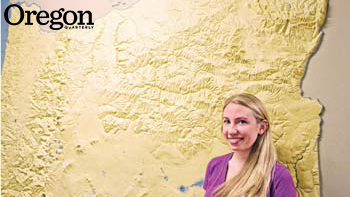 Nearly every day I walk past a sprawling relief map of Oregon that hangs in a corridor of Condon Hall. It's not just the size of the eight-by-ten-foot map that's so compelling; it's as if its soft contours are inviting passersby to stop and take a look. In just a quick glance, I can see all of Oregon's 98,000 square miles. The touchable elevations and depressions give a singular, visceral, and immediate sense of this vast state. Solon Shedd oversaw the fieldwork and original construction of the map for the Oregon Bureau of Mines and Geology. Its total cost back in 1914 was near $100. The vertical scale of the map is 4,000 feet to the inch—the 8,000-foot rim of Crater Lake's caldera rises about two inches. The mapmaking team meticulously built up the elevations using one-eighth-inch strips of cardboard, custom cut and secured on top of one other; each of these thin layers represents 500 vertical feet. The process was continued until the highest elevation point of Oregon was reached, then a coating provided a uniform texture and color. Looking at this map tucked away like hidden treasure and knowing the staggering amount of work that went into creating it, I am in awe of the knowledge of topography, the mechanical ability, and the remarkable degree of patience that went into its creation. Many others, too, have paused to take in this map and been moved by its unrivaled quality. That's what Stuart Allan—now an internationally regarded cartographer—did in 1972. He figured that a geography department displaying such a thing must be a worthwhile place. He enrolled in the graduate program and was soon working side by side with UO geography professor Bill Loy on the first Atlas of Oregon, published in 1976 (they reprised the collaboration on the greatly expanded 2001 second edition). Today, half a dozen of Allan's own maps also adorn the walls of the geography department. He points to his first viewing of the big map as the moment that launched his career. After nearly a century of contact with an unimaginable number of inquisitive fingers, the map was showing its age, so the geography department recently brought in an art restorer. The newly refreshed map remains remarkably simple and easily understandable—ready to inspire for another hundred years. Amy Marsha '13 recently graduated with degrees in both mathematics and geography. She is currently a first-year master's degree student in the Department of Statistics at the University of Washington.